"TIMELESS" 48" x 39" acrylic on canvas. I was inspired to paint this picture while sitting on the beach absorbing the beauty surrounding me. 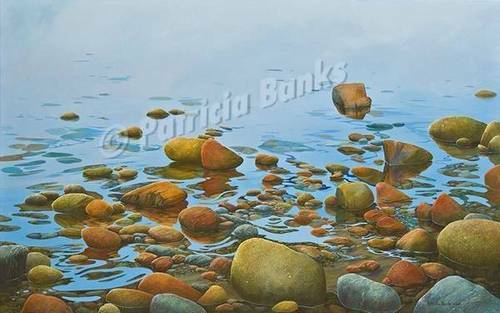 As I sat watching the tidal waters gently moving in and out and around the rocks, I became fascinated by the water and how its movement, timelessly led me past the surface to see so many more layers. It seemed such a beautiful analogy to life. While enchanting and peaceful, the more you look at it the more intriguing it becomes as the many layers of water and rock begin to tell their story.